7. 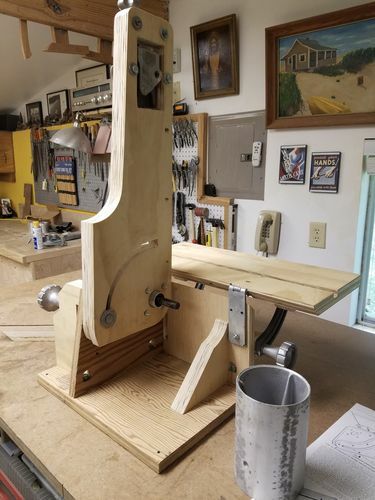 Mounted 1/2 hp 1750 rpm motor and sander to stand. Played with the sander yesterday to see how it works. It’s a simple machine, so I didn’t expect too many issues. What was frustrating is how difficult it is to properly track the belt. It is very difficult to set the belt so it doesn’t run…takes almost constant adjustment while operating…a real pain, frankly…but a problem I’ve read about in other blogs. I’ve been told crowning the adjustment roller helps…I’ll give it a go and see how it works out on practical projects. It was a fun project and cost me less tha $50 all together. Happy to see this. Excellent work! I bought that same kit 30+ years ago, and it’s still “new in box” today. 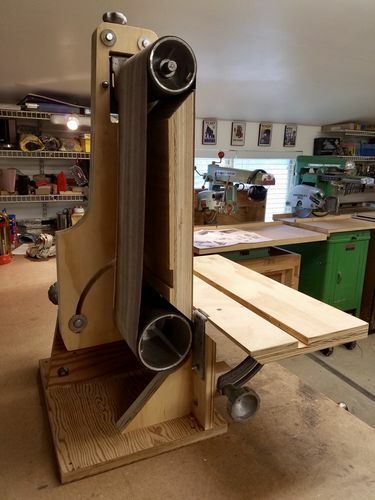 My plan was to build the Roger Heitzman modified stand so the sander can rotate 90 degrees for use as an edge sander. But, 30 years later I’ve never started the project. 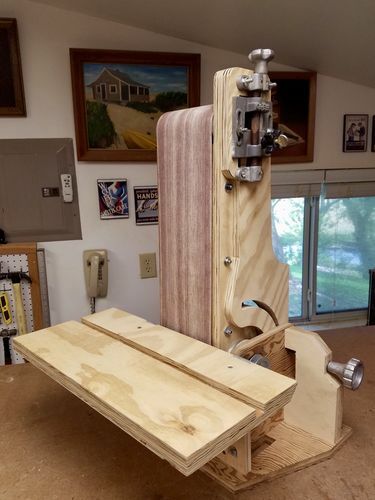 This kit was on my mind because I was recently given a used Grizzly 6×48 belt sander. Runs rough and I cannot get the thing to track straight for even 5 seconds. The table bracket is such soft metal that the table moves off square to the belt as I sand. So after trying the Griz, I went back to thinking about building the Gil-Bilt. I’m discouraged by your report on the tracking, hope crowning the rollers helps. Will check mine this weekend, I thought the rollers came crowned already? Very interesting post, enjoyed learning about this kit. Very well done. Yep, gotta have that top roller crowned. I’ll work then. 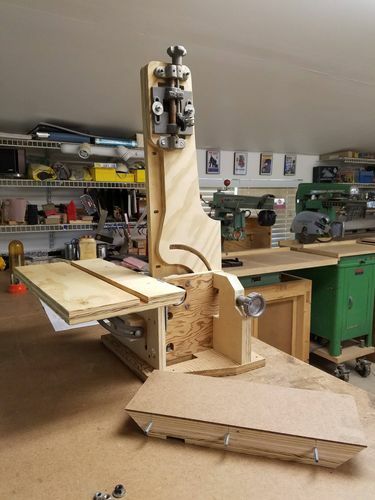 I have a 1940’s era Delta 6” x 48” floor mounted belt sander and the top roller is crowned. It still can be a touch “fiddlely” at times if some cheap belts are used as they stretch over time from the tension and tend to become troublesome. Harbor Freight belts, though cheap, seem to work fine. Thanks for the additional pics. So the sanding table is wood painted silver? 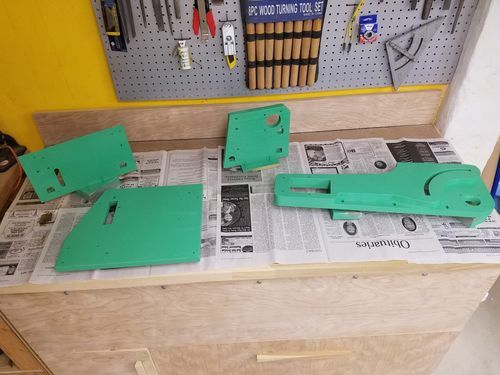 I thought it was aluminum until I saw the build pics. Looks great! 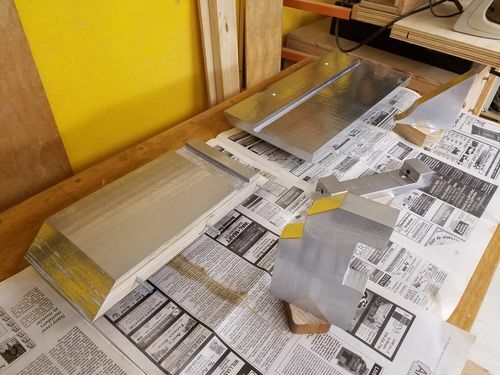 Where in the assembly does that thick silver piece with the mitered ends and a dado go? Looks like it has three machine bolts coming out of the edge. 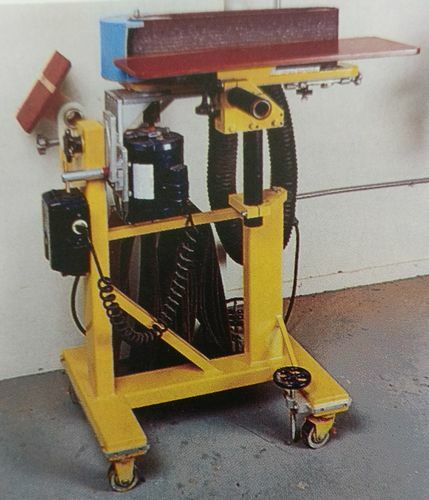 The platen is made of several pieces of sandwiched and glued plywood topped with hardboard. This piece is attached to the arm with three hanger bolts. The metallic paint did a good job of covering the plys and looks pretty good, too. Wanted it to match the color scheme of my Red Star RAS. to get an idea of how much crown is called for. I’d like to build one, I’m thinking about the wood gears version by Matt Waddle, it looks great. Awesome engineering and colouring. Looks realy authentic industrial style. Hvala, Ivan … Mislim da je također bilo sjajno. Pokušat ću ovaj vikend kruniti gornji valjak za namještanje trake kako bi vidio rješava li problem praćenja.